Shalom! I am Shadman Zaman. 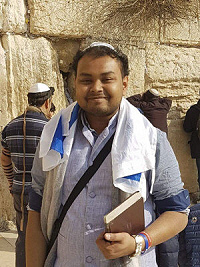 I am the first Bangladeshi national in history to travel to Israel and this is my story. If the social trends are anything to go by, then I would have been an anti-Semite like most of my countrymen not someone who is on the threshold of orthodox conversion to Judaism. I would have hated Israel and thought of Israel as the root of all problems and Zionists as the controllers of the world who wanted to destroy Muslim identity. But bucking the trend, my story ended up rather differently. Bangladesh, a country of 180 million people with 90% Muslims, was born with virtues of secularism but political turmoil and subsequent military coups established governments who were sympathetic to Islamists and dependent on middle eastern aid. This made Bangladesh a breeding ground for Wahabi Islamic teaching which has plagued the middle east. This version of Islam promoted by Saudi Arabia, the driving ideological force behind groups like ISIS and Al-Qaeda, also found its way into the minds and textbooks of Bangladeshi people. Most people around me hated Jews and Israel and in a country where there are no registered Jews there was hardly anyone to teach the people about the greatness of the Jewish people and Judaism. My textbooks and teachers in school used to demonize Jews and Israel as the “Satan.” The culture of Bangladesh used to encourage and indoctrinate its people in anti-Semitism from a very early age. But my story was to be different. Being born into a very affluent family, I was brought up in a culture which promoted humanity above all else. My father is a secular atheist who never followed any religion and my mother is a very liberal Muslim. My maternal grandfather, an atheist, was the first Bangladeshi Zionist and it was he who introduced me to Zionism and the greatness of Judaism. At school and in public places, I was always told to hate Jews but at home my parents and my grandpa always told me not to. They told me to read about Judaism, Zionism and Jewish history. They told me to read first and then question myself whether the hatred that the common people of Bangladesh harbour towards Jews was justified or not. As a result of my curiosity and encouragement from my parents, I read the book “A Case for Israel” by Alan Dershowitz at the age of 12. Since then I have read a lot of books on Israel and the middle east and I have no doubt that to prevent another holocaust, there has to be an independent State of Israel. In fact, on the centenary of the Balfour declaration, I believe if it had been acted upon after the First World War, 6 million Jewish lives wouldn’t have been lost. So, if Britain should apologise to anyone then it should be the Jews for backtracking on the Balfour Declaration. My father is an engineer and my mother is a teacher, a philanthropist and a women’s rights campaigner. 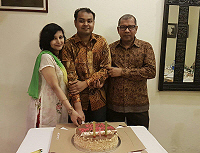 Under their parenthood, I became a doctor from Chittagong Medical College. I finished my medicine in January 2015 and did one year of internship in Bangladesh. Then I decided to move to the UK in order to pursue my career as a doctor as I was fed up with the hatred filled culture of Bangladesh. While in Bangladesh I used to write against anti-Semitism and how it would be beneficial for Bangladesh if they had diplomatic relations with Israel. Because of my Israel advocacy I regularly received death threats from Islamists. They also threatened my parents too. After I came to the UK, I found that anti-Semitism is as high here as in Bangladesh. And I found it to be my moral duty to stand up against the hatred towards Jews. I took to the streets with a lot of my fellow Zionists and started campaigning and upholding the truth about Israel. I passed all the registration exams in between and became an A&E doctor in the NHS and also joined Queen Mary University of London to do a masters in public health. I was shocked to see the level of hatred towards Israel and Jews in the university campuses and I started advocating for Israel in my university too and now I am the secretary of the “Jewish and Israel Society” of Queen Mary University of London. 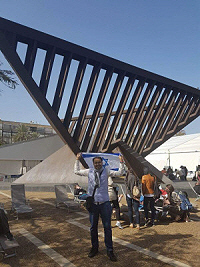 While advocating for Israel and working as a doctor and studying for my masters, I decided to take a break for a week and visit Israel. I knew that if Israel approved my visa application then I would be the first Bangladeshi national to do so as the previous Bangladeshi, Salah Chowdhury, who had attempted to go to Israel in 2003 is still in jail in Bangladesh. When I applied for the visa, I was petrified and almost sure that my visa application would be rejected as Bangladesh is one of the countries that bans its citizens from going to Israel. But the opposite happened and I went to Israel, funded by myself, and travelled all over northern Israel with a very close Israeli friend of mine, Talia Rozenfeld. I was in Tel-Aviv but I also visited Jerusalem (the Kotel, the Temple Mount/ Al-Aqsa mosque, the Church, the Mammilla Mall and Yad Vashem), Haifa, Casearea, Netanya, Abu Gosh, the kibbutz Ma’ale Hahamisha and Saarei Tikva. I prayed at the Kotel which was a unique feeling and one of the factors of my decision to convert to Judaism. After coming back from Israel, I felt even more obligated morally to tell the truth that I witnessed there, which is the democratic rights Israel provides to all its citizens irrespective of their colour, ethnicity and religion. Now I campaign on a regular basis in the UK about the truth of Israel and I face lots of abuse for being a Zionist and also for my decision to convert to Judaism. For me, anti-Zionism is the modern anti-Semitism and most people in the world can’t fathom the idea that Jews have a vibrant place that they can call home. While advocating for Israel, people ask me how I connect to Zionism. I tell them that being Bangladeshi, a nationality achieved after a liberation war against an oppressive Pakistani military dictatorship that saw Bengalis as low-class humans, I could easily identify with the nationalistic aspiration of Jews to have a homeland of their own. For me, Israel is the only light in the middle east and a solution to all problems in the middle east. Anyone who claims that Israel was born out of violence must remember no country after 1945 was born without violence. From India to Kosovo, the history of post colonial states are littered with violence but also with hope. And I see Israel as the hope of the Jewish people towards a glorious future, a future without anti-Semitism for which I strive and am committed to. Let there be no more anti-Semitism, let there be no more racism, let there only be peace and love. Let people call Jews as “Friends” and not as “Dirty Jews.” Let us never hear again, “Jews will not replace us.” Let us work to create a society which says, “ Jews and people of all religions and ethnicity are welcome.” NEVER AGAIN SHALL THERE BE ANOTHER HOLOCAUST! AM YISRAEL CHAI!